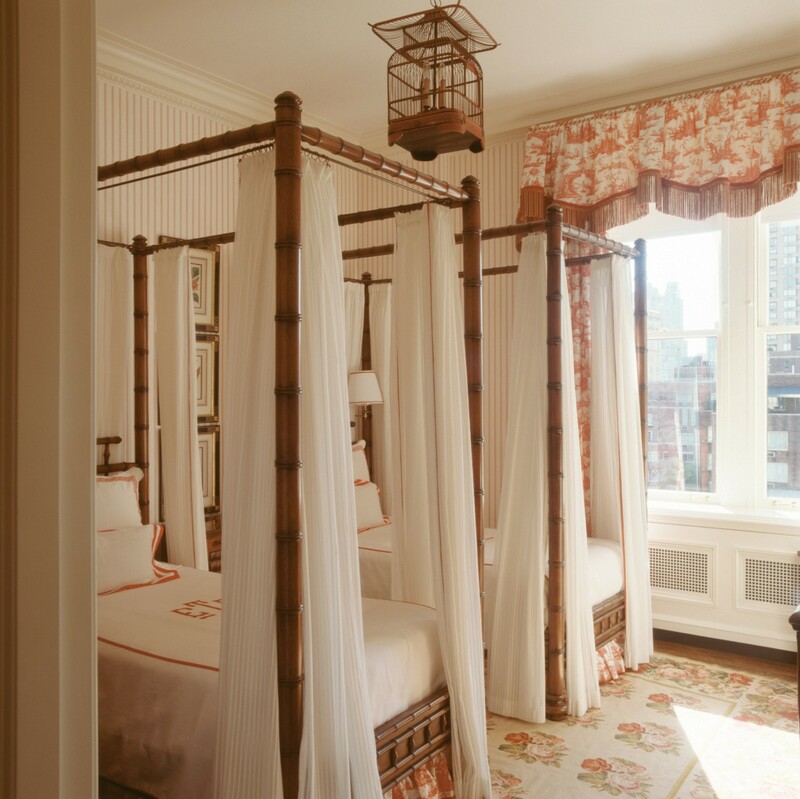 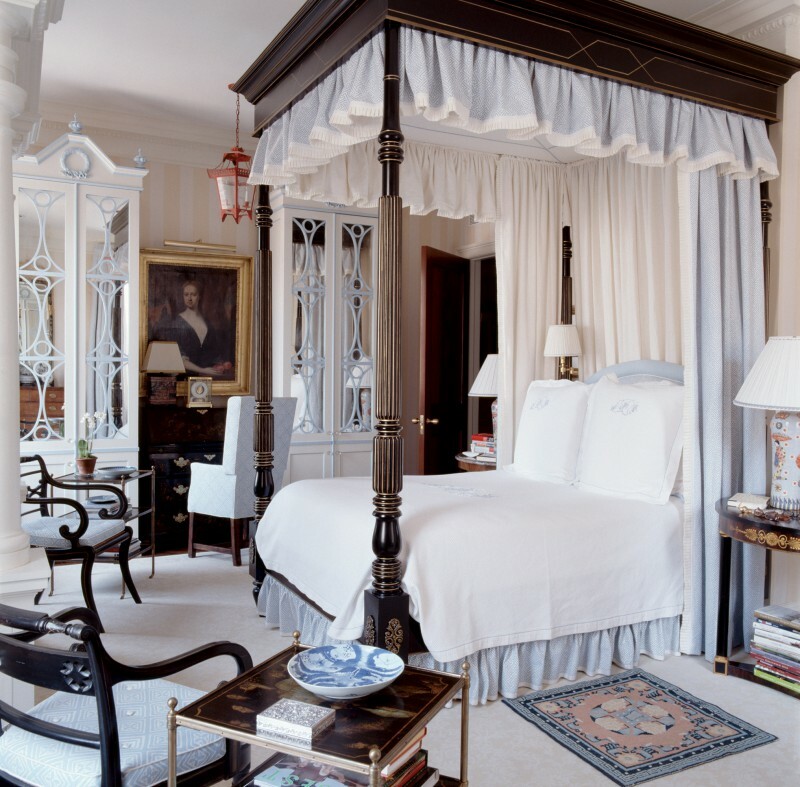 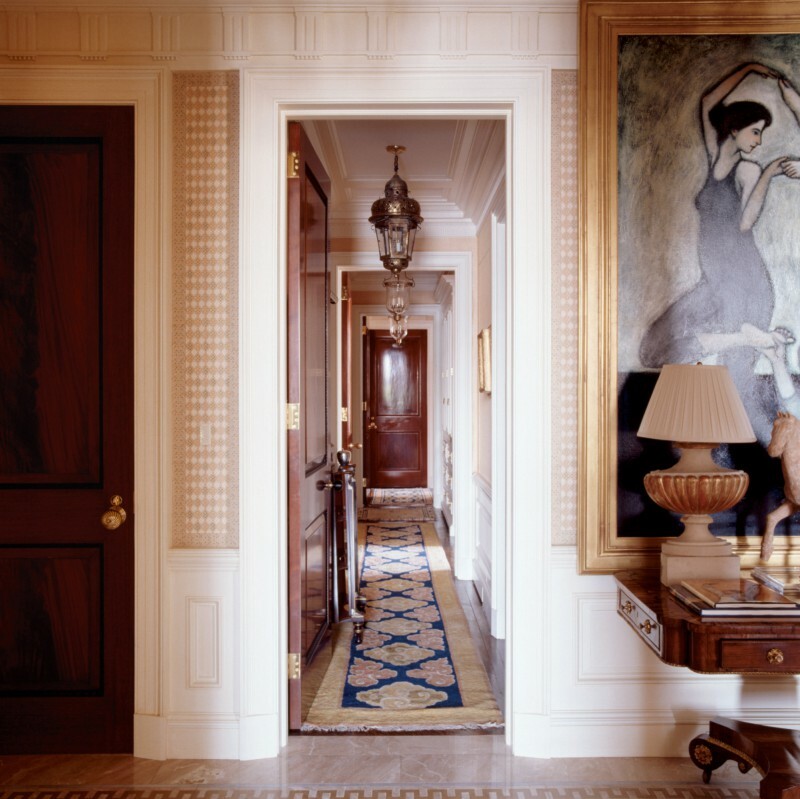 Timothy Bryant’s restoration and renovation of this Park Avenue residence re-imagined the 1917 apartment as an elegant pre-war home. 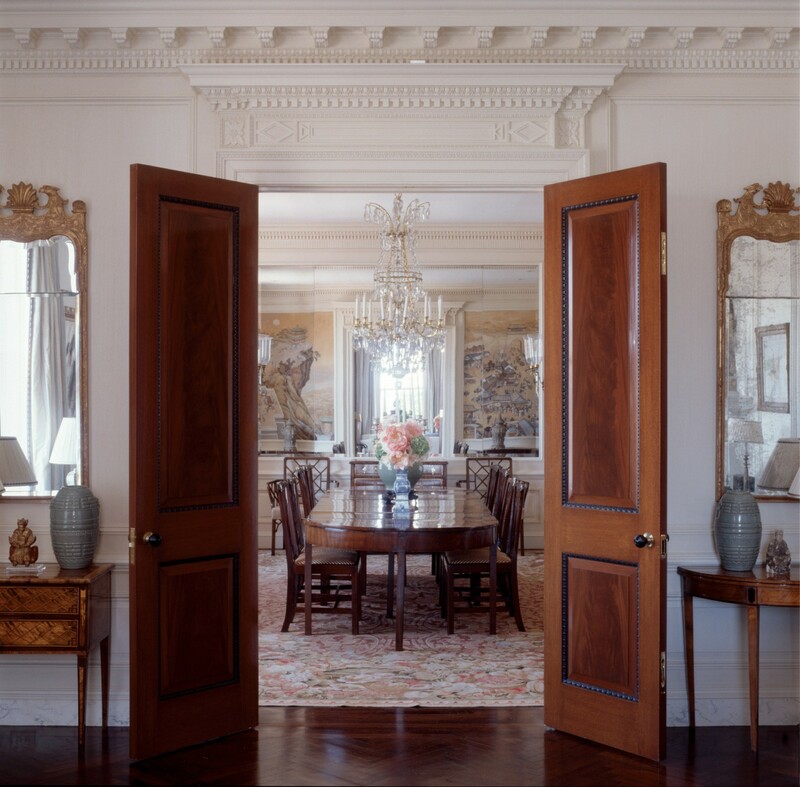 Wren-period Georgian profiles and James Gibbs-inspired cornices convey a loosely 1930s feel, made all the more authentic by the revised layout’s traditional division of formal and private areas, with the foyer as the central circulation area – as original architect J.E.R. 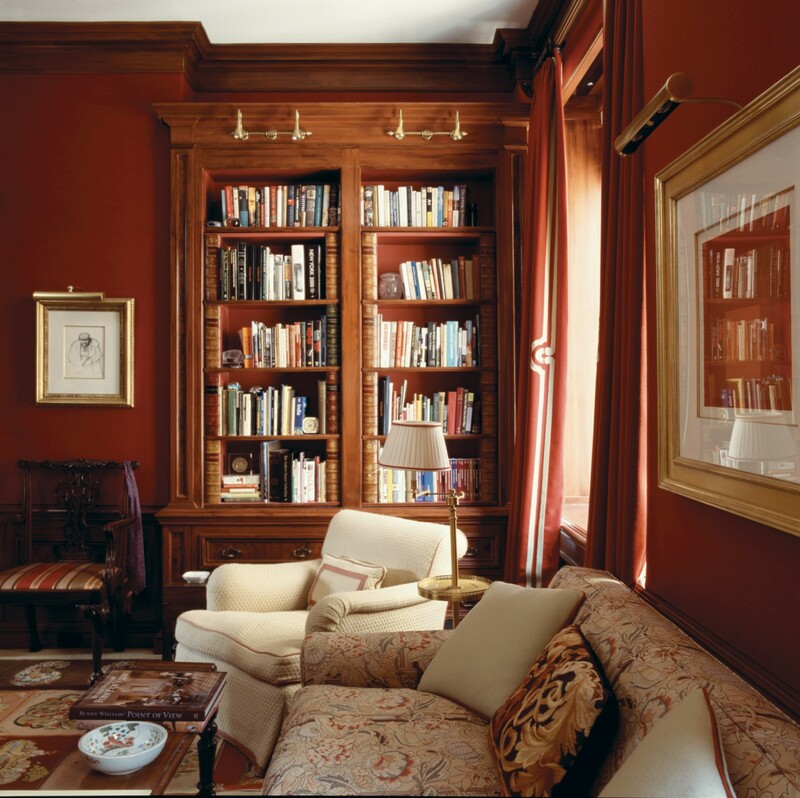 Carpenter intended. 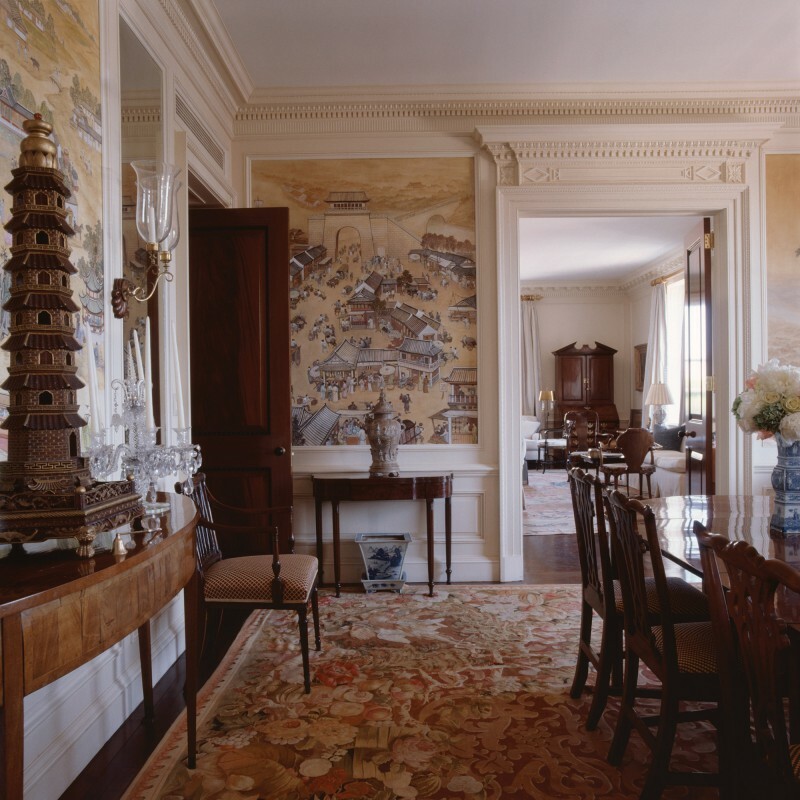 In the entry hall, Doric entablature meets Mauch cornices, gold-leaf cove moldings and hand-printed Italian wallpaper. 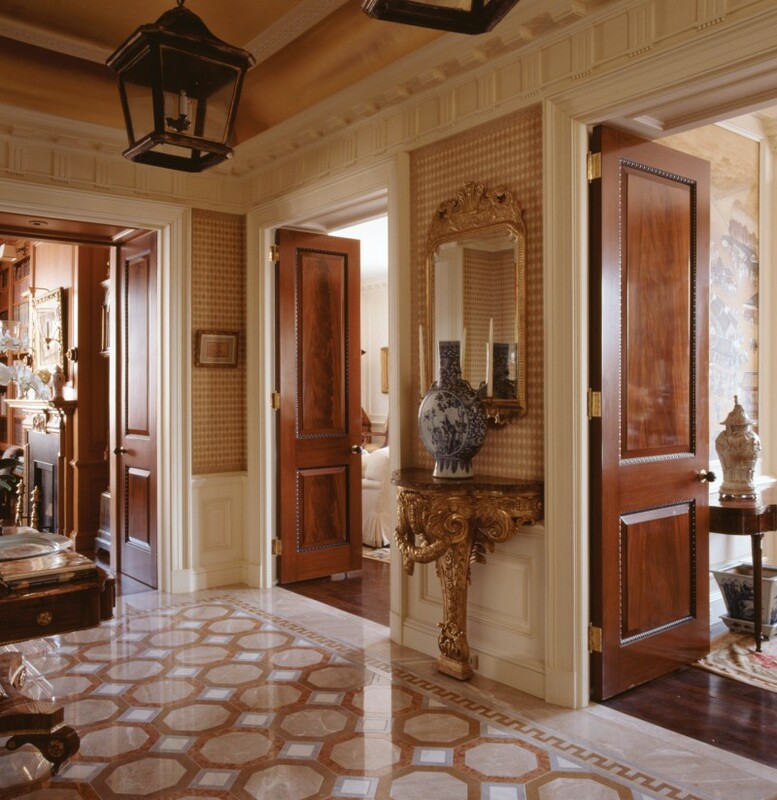 A floor of interlocking octagons, fabricated in water jet-cut stone, references Venice’s Convento della Carita. 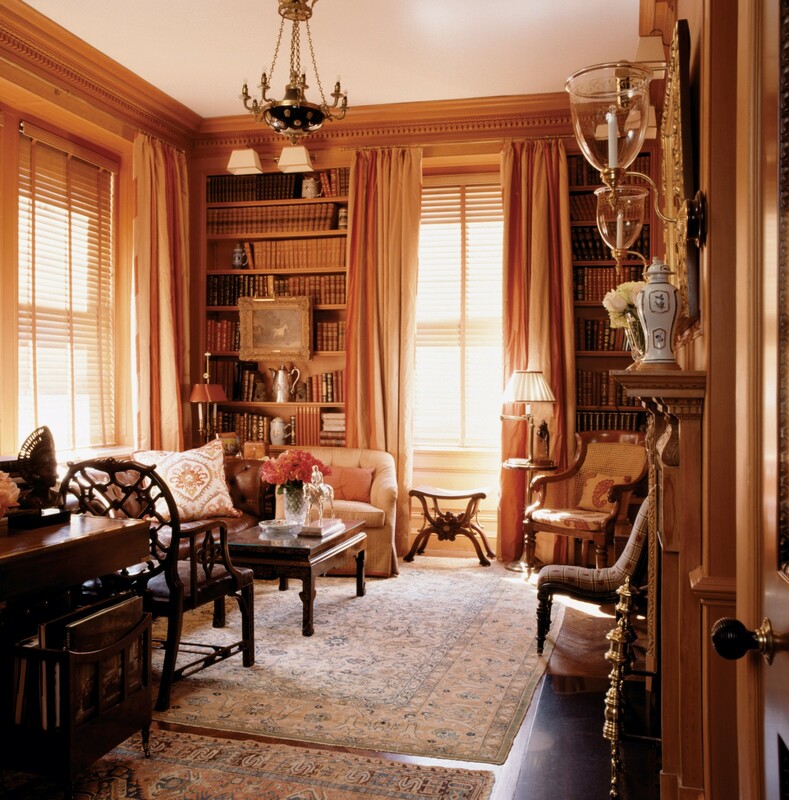 To the south, the rebuilt library was handcrafted in Paris, in old-growth Oregon pine, and showcases a salvaged Georgian carved-pine mantle. 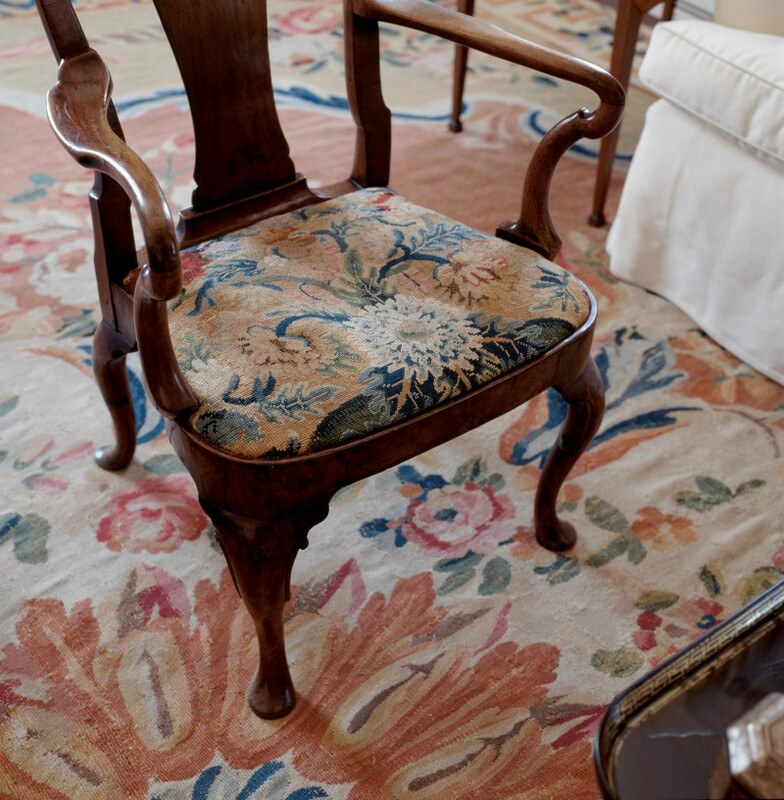 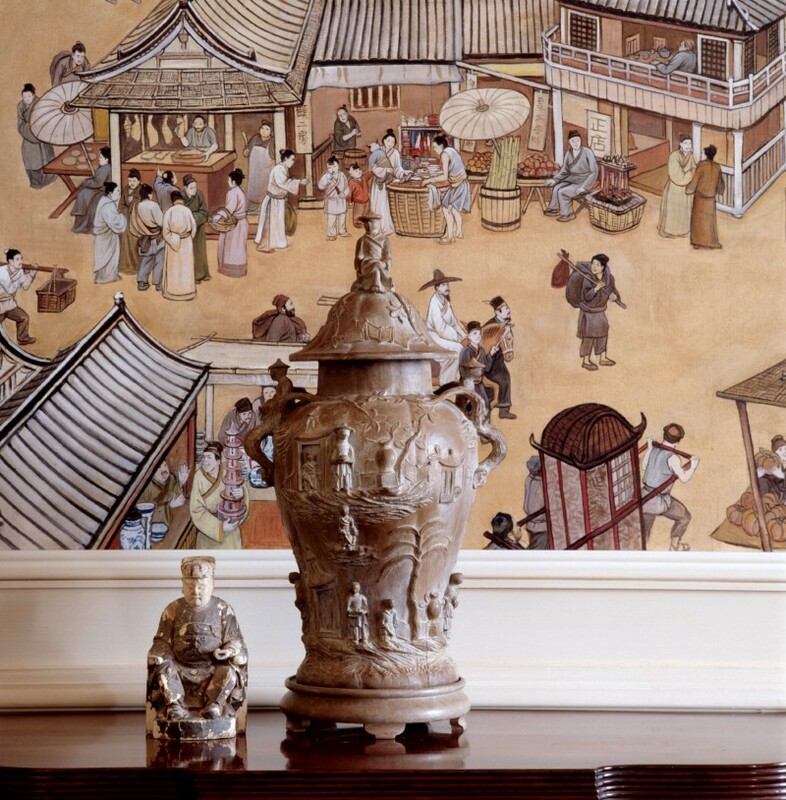 The client’s remarkable art and furniture collections are front and center in every room, where ceramics, murals and rugs, and ancestral paintings are side by side with impeccably crafted new pieces. 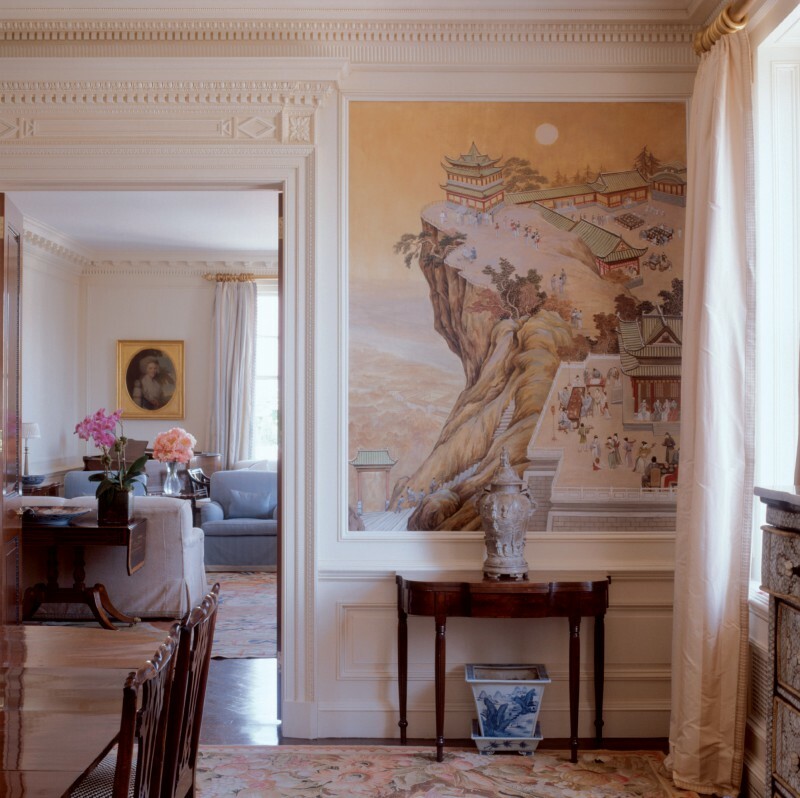 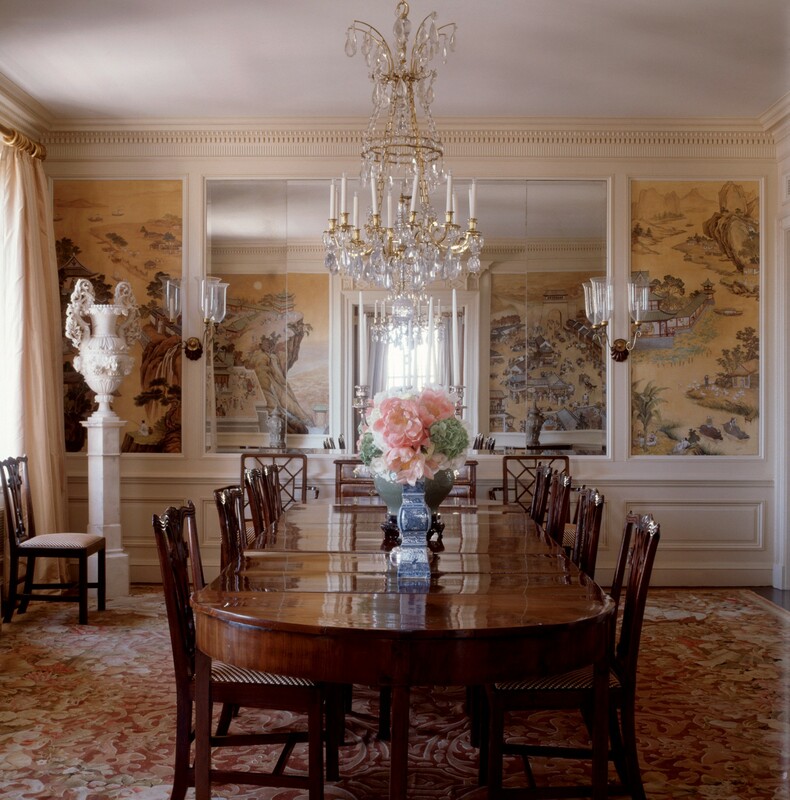 Against the depth and shadow of the dining room’s highly embellished moldings and over doors, mid-20th-century Irish and Asian themes come together in the specially commissioned Chinese murals, Irish sideboard, ceramics, and Aubusson rug. 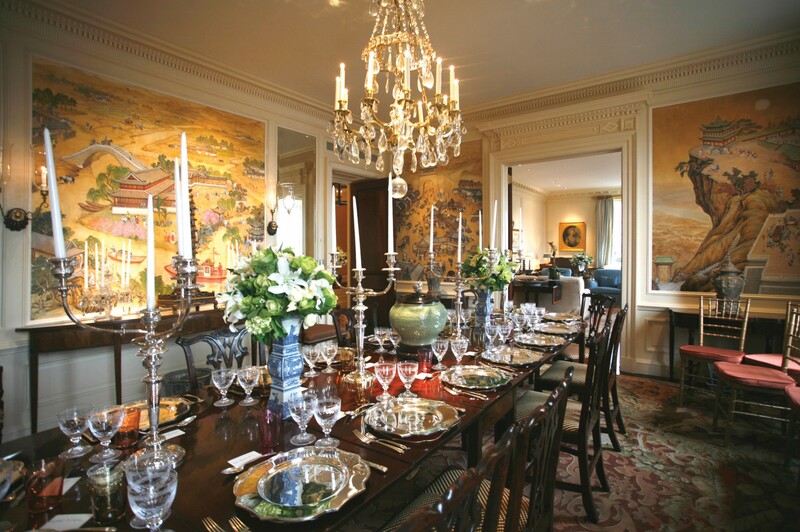 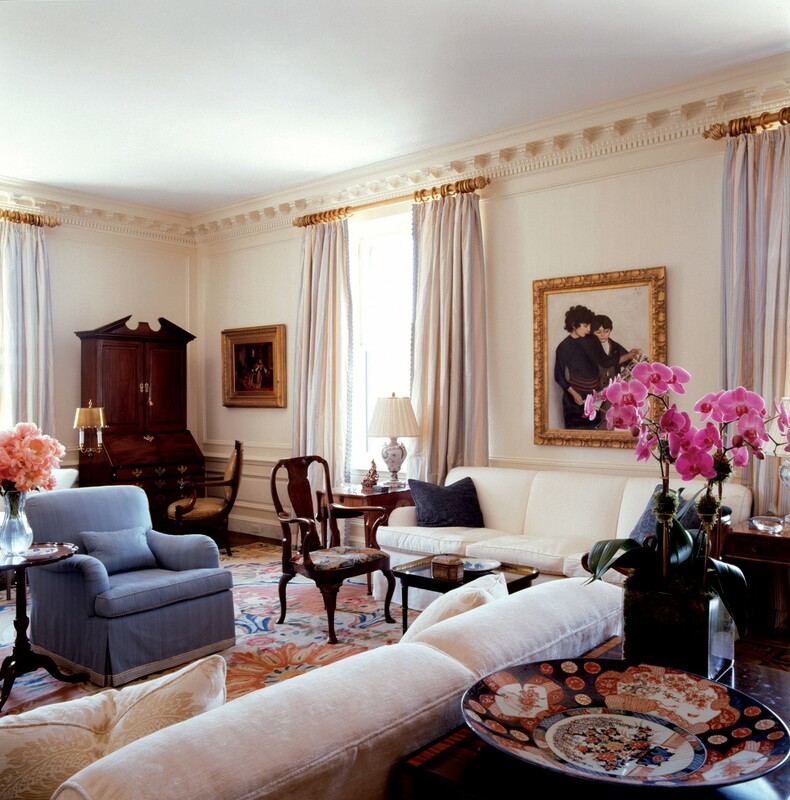 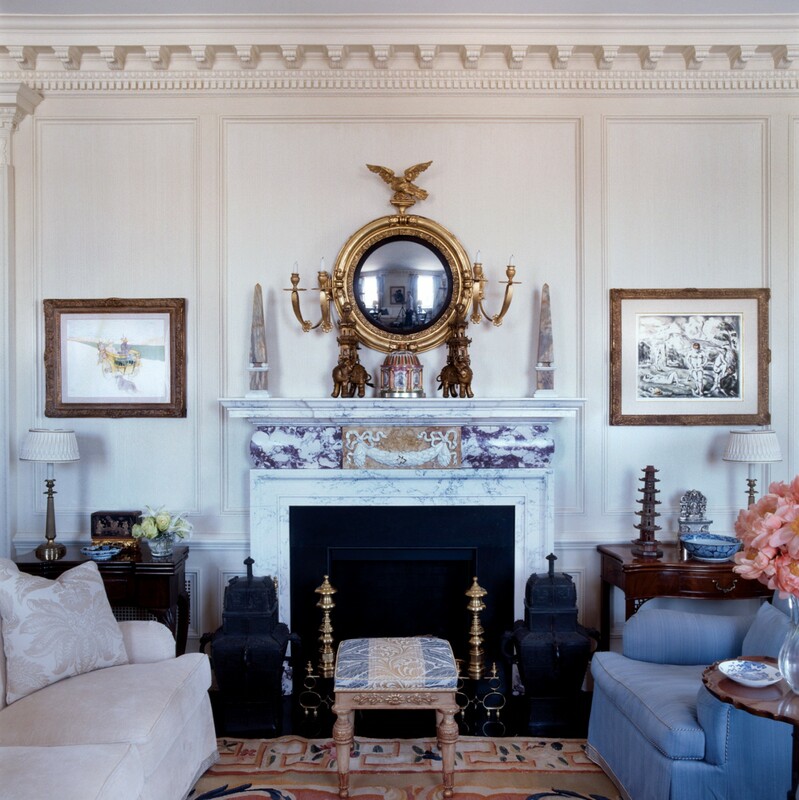 The same serendipitous mix is found in the living room, where Bryant’s Corinthian entablature introduces the client’s Georgian-style Scagliola mantel and an antique mirror, purchased in Ireland more than 40 years ago. 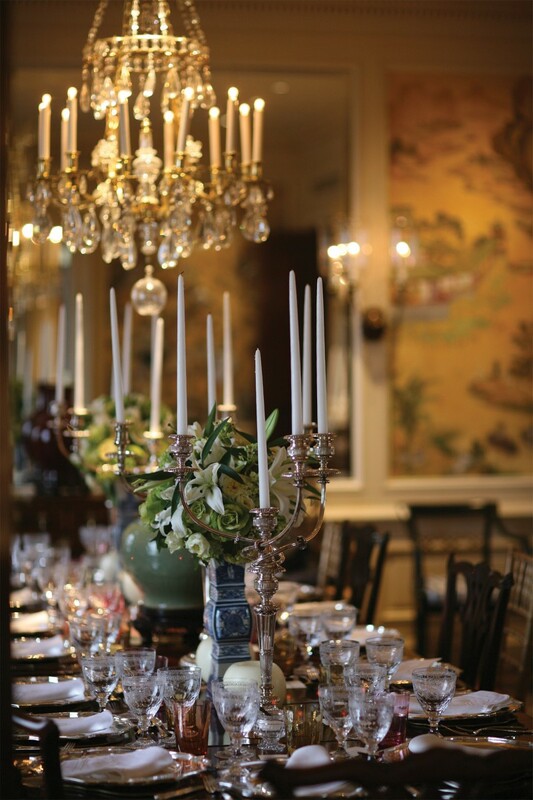 From the refinished original Cuban mahogany floors to the restored steel windows, and subtly distressed Georgian dining table, a love of old things is evident throughout. 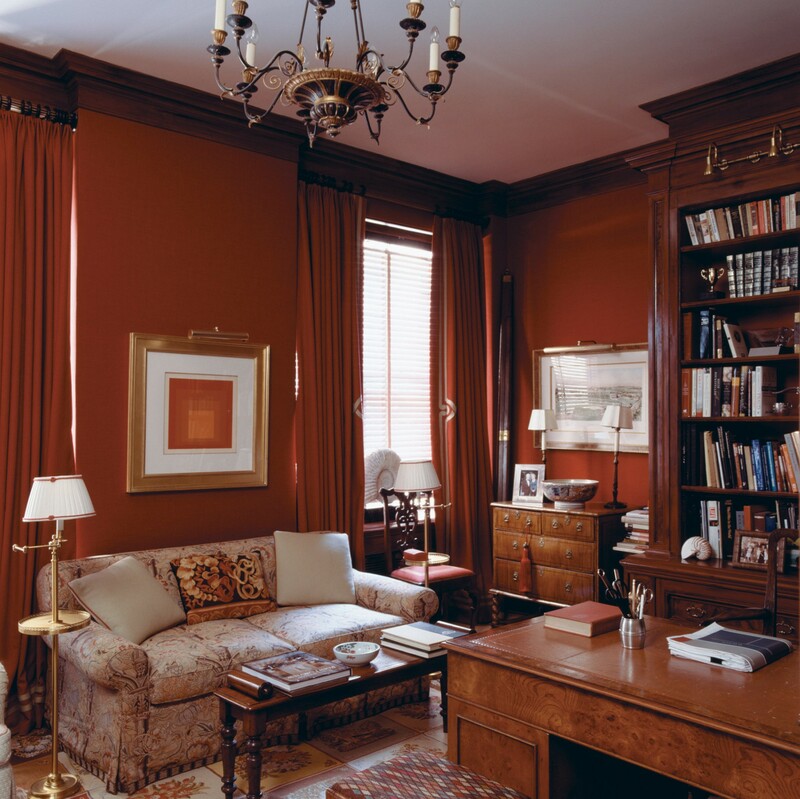 Nonetheless, the apartment is thoroughly equipped for the modern day, with closets, TVs and other amenities tucked behind hidden closets, doors, reversible bookcases, and even a framed painting in the living room. 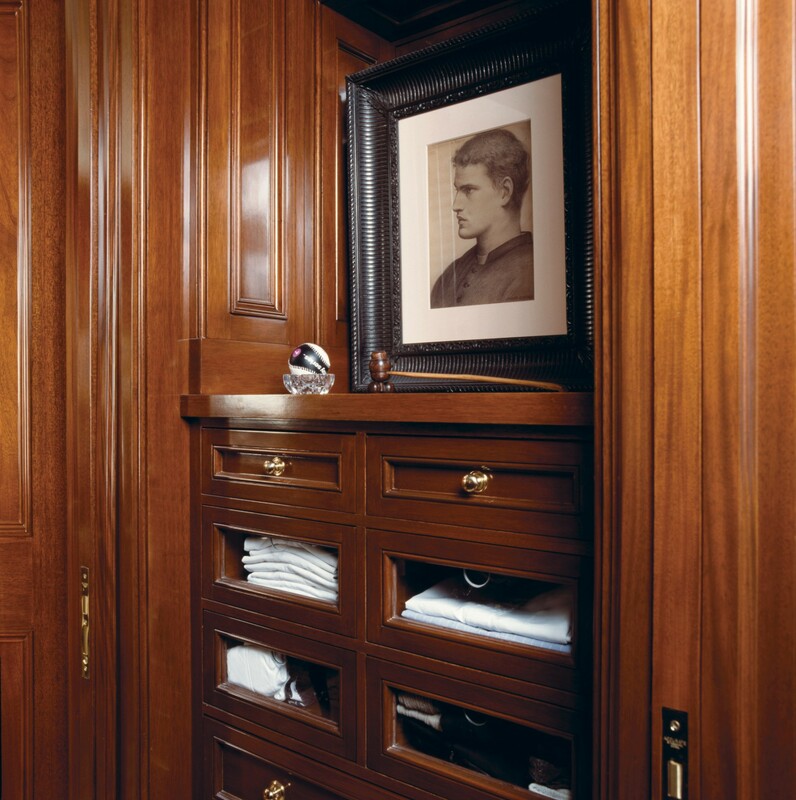 Design is in the details. 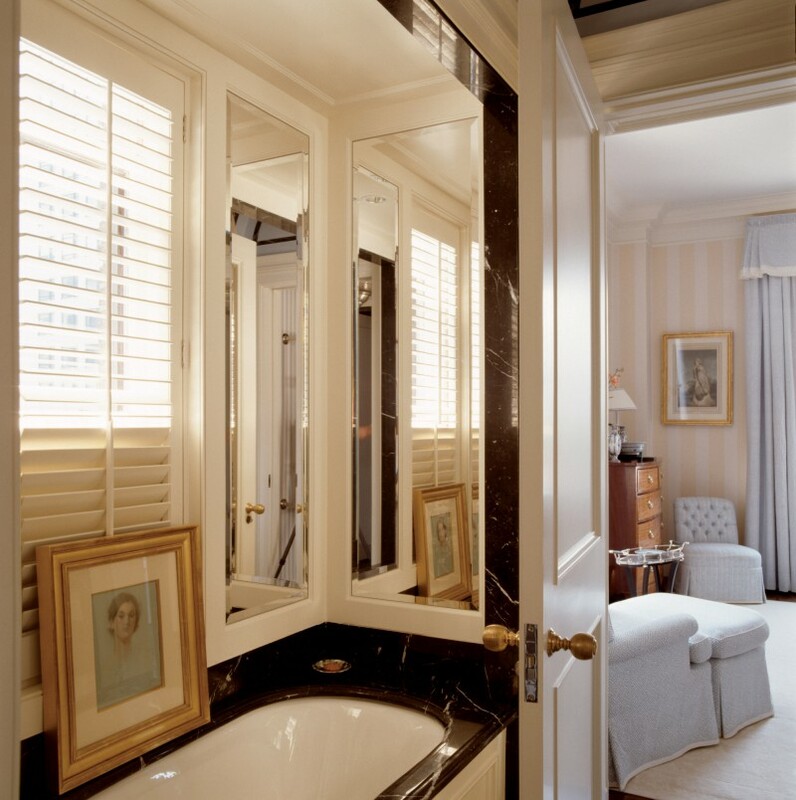 A rhythm of wall planking provides a sense of continuity between the main living spaces, while unique hardware pieces by Charles Edwards of England, are eye-catching finishing touches. 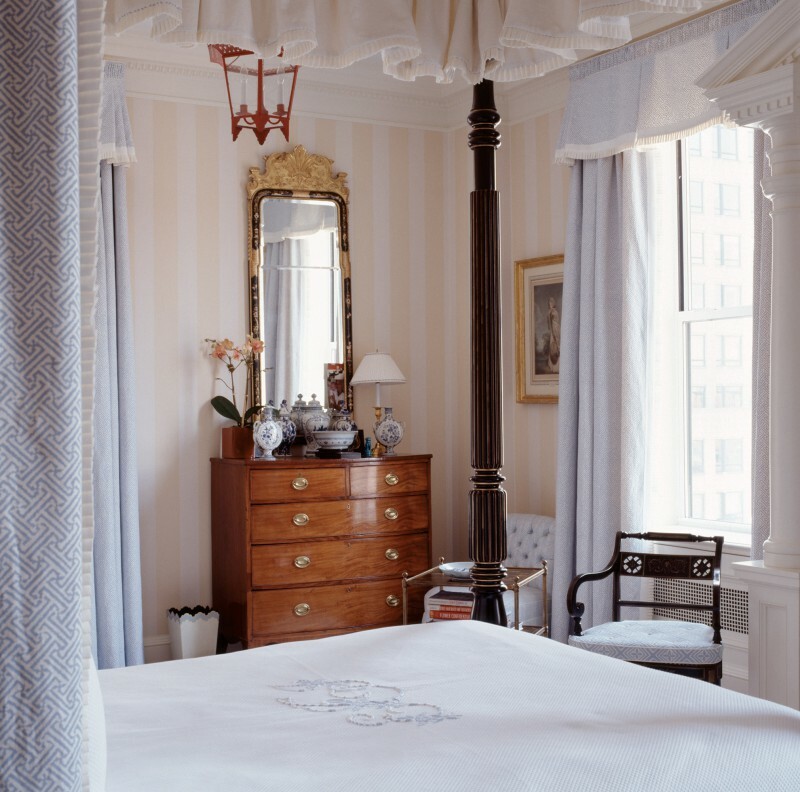 Examples of this abound, including the front door’s swirl knobs, the Regency-style ebonized beehive doorknobs elsewhere, and black egg-and-dart moldings to top it off. 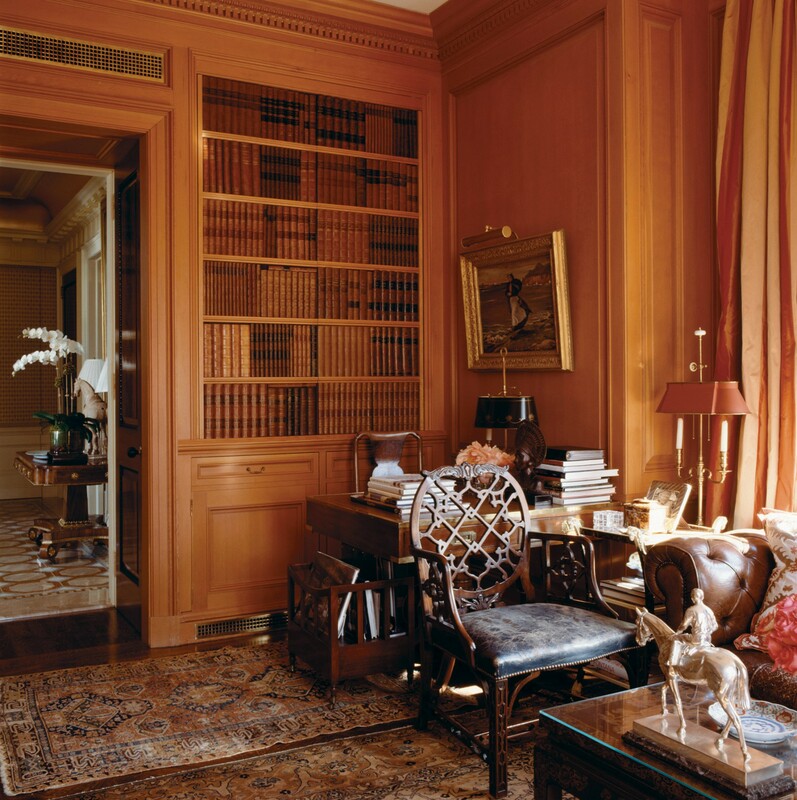 More than 90 years since his groundbreaking design, Carpenter’s blueprint for traditional apartment living survives on Park Avenue. 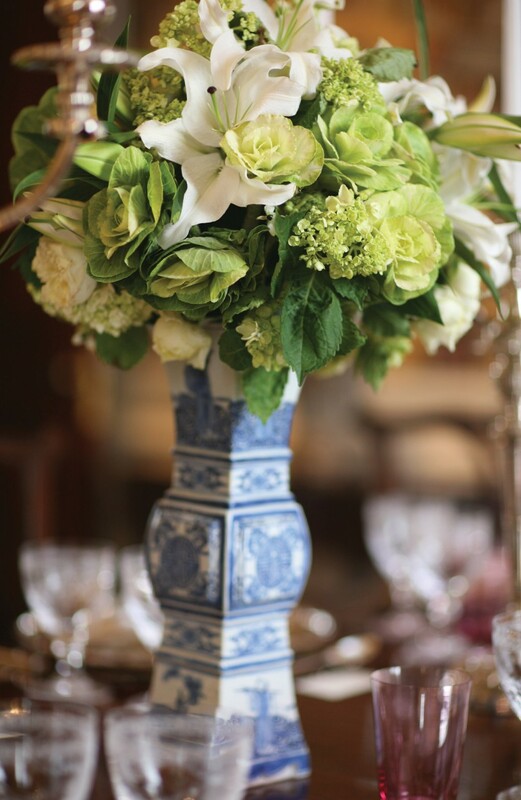 And now, it is timeless.